I have a personal Instagram filter that protects my eyes from all the cute pet pictures. But now and then, a dog or cat slips through. One pretty pooch in particular — an Alaskan husky with arresting, ice-blue eyes — has me looking forward to her daily adventures in rural New Hampshire. Stare into the eyes of Bella, and you’ll get a glimpse into the heart of her owner, photojournalist Cheryl Senter. “There is total love in every image that I take of her,” Senter told Cult of Mac. A photojournalist for more than 30 years, Senter is a relative newcomer to Instagram, the photo- and video-sharing service that’s turned some pet owners into rabid oversharers. Does anybody really need another picture of a costumed Chihuahua? Probably not. But Senter’s photos of Bella — whether the dog is playing in water, romping in tall grass or preying on woodchucks — possess an epic quality that’s part Game of Thrones, part Ansel Adams and 100 percent captivating. The natural beauty of the images should come as no surprise to anybody familiar with Senter’s career. Her news photos regularly appear in papers like The Boston Globe and The New York Times, which recently assigned her to document heroin addiction in Vermont. In 2003, she was part of a team at The Eagle-Tribune that won a Pulitzer Prize for spot news. Her clients often ask her to send Instagram images from her assignments, especially when she covers the many political campaigns traipsing through New Hampshire. When she first began using Instagram last year with her Android phone, it did not strike an immediate nerve. 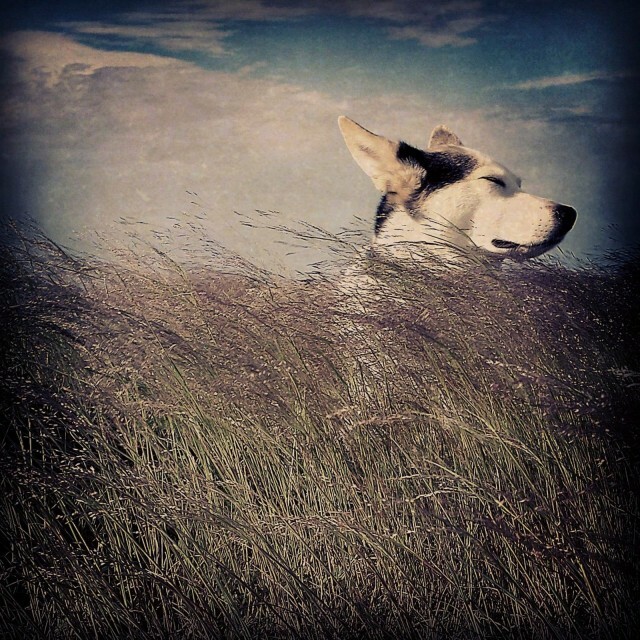 But that first photo of Bella, a single clear eye peeking through tall grass, opened Senter’s eyes to the artistic possibilities that come with Instagram filters and various editing apps, her favorite being Snapseed. Senter selects the filters based on the feeling each picture gives her, likening the application of the filters to when she hand-colored fiber prints as a teenager. Senter said Instagram has been a “godsend” for providing the kind of camaraderie she has been missing since 2006, when she last worked full-time in a newsroom. Now her more than 900 Instagram followers are about to be treated to an unfolding drama: Another woodchuck has trespassed upon Bella’s territory, and Senter said the husky is possessed with finding the creature. All photos by Cheryl Senter. Follow her on Instagram (@cherylsenter).